Increased security, affordability and the communal lifestyle are all alluring aspects when potential buyers consider sectional title properties. The quick definition of a sectional title unit is a property in an undivided share of a common property. These units are known as townhouses, flats or apartments, and duet houses. Lightstone, the trusted provider of comprehensive data and analytics for the property market, investigates the sectional title purchasing patterns over the last 15 years. From 2003 a slow decrease in the purchase of freehold property occurred year on year, estate purchases have remained consistent, and the interesting part is the growth of sectional title property of up to five percent. “As we see in the data, the largest percentage of sectional title properties are sold in Gauteng,”r; says Hayley Ivins-Downes, Head of Sales at Lightstone. According to Ivins-Downes this is attributed to the higher population density of cities and the demand for property near the business districts. In the Western Cape, 0 -70 sqm units account for 51% of sales, 34% in Kwazulu-Natal and 36% in Gauteng. The view of the number of bedrooms varies between the three provinces: In the Western Cape, one bedroom apartments attribute to 20% of sales and 59% of the Western Cape’s sectional title units are two bedroom units. These figures are the highest of all three provinces. According to Ivins-Downes potential buyers would rather compromise on size and opt for a coastal home or a view. It’s not surprising that many property owners view property as an investment, and according to Ivins-Downes this could be proven in the data where 44% of additional properties are bought in Gauteng. 82% of these owners would currently own a property in the same province and 14% would buy a property in Kwazulu-Natal or Western Cape. In a comparison of estate, freehold and sectional title, Centurion in Gauteng has experienced top growth in estate living and Sandton’s sectional title segment has grown by 11% since 2013. In the Western Cape, Cape Town has held steady with 3% growth in sectional title and a 2% decline in freehold. The most growth in sectional title was seen in the Strand with a 12% increase in 2017 in comparison to 2013. 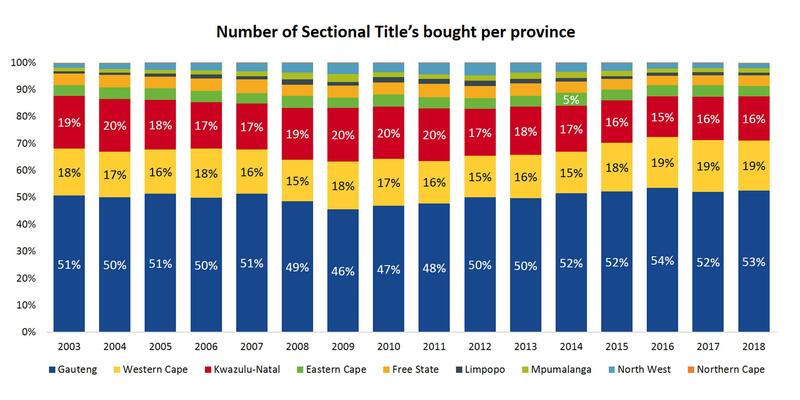 In 2013 Umhlanga was the most popular sectional title offering with 74% of transfers and in 2017 Amanzimtoti is now the most popular with 78% of sales occurring in sectional titles. Additionally, Amanzimtoti was the only town that showed growth in sectional title as estate living popularity rises year on year in the province. Ivins-Downs continues by explaining that the growth in sectional title will continue to grow over time as demand for this property segment increases amongst all demographics.